This program respects the Chinese tradition of lineage and the relationship, trust and bond between the Master and the Disciple (read more on Lineage). It is unlike commercial programs, thus students can be assured of the authenticity and efficacy of the techniques. Feng Shui is based on Yi Jing (易经) the book of changes and the knowledge of the Yi Jing Principles – Numerology (易数) ，Structure （易象）, Logic （易理）, and The Hexagrams (易卦). It is the study of how man can live in harmony with the nature. This program is targeted to unravel many secrets that Professional Feng Shui Practitioners keep closely in their lineage and pass on the best-kept secrets, skills and wisdom only to worthy disciples. Master Sanna passes on his knowledge and wisdom in this course with his own practical experience and lineage. All substances and beings are a form of energy. You will be taught on how to observe the flow of energy (氣的觀望), identify if the energy is auspicious or inauspicious (氣的旺衰) and how to intercept auspicious energy (氣的攔載). The importance of differentiating between Yin and Yang. Practical application of Feng Shui that works; Some shops with White Tiger on it’s right （白虎), higher than the Green Dragon on it’s left （青龍） can still bring in good business. Clarification on why some shops without a building behind its back （靠山） can still have good business. Not all properties facing a straight road or a T-Junction is said to be inauspicious. Why some buildings with a sharp-pointed edge can bring auspiciousness instead of inauspiciousness. Why only certain units or apartments, out of the entire row, though having the same sitting and facing, are more prosperous. True North or Magnetic North as the correct Feng Shui reference. Basics on the right location on a property to take a reading using the compass （羅盤); e.g. balcony, front or back of property, or door. 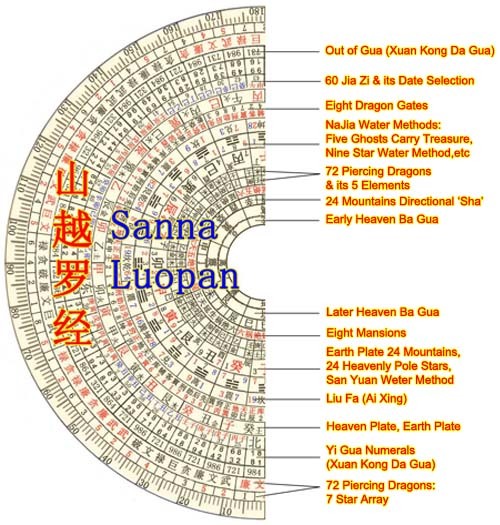 Limitations of Flying Star Feng Shui in total macro Feng Shui consideration and when to use which method for practicality. Discussion and true illustrations of how a property with ‘Prosperous Sitting and Prosperous Facing’ （旺山旺向）in Flying Stars Feng Shui does not prosper and a property with ‘Up Mountain and Down Water’ （上山下水） can still prosper. How the Two Cycles & Eight Periods （二元八運）, and the Three Cycles & Nine Periods （三元九運) are applied respectively. Tai Sui （太嵗）can also bring in wealth and prosperity instead of mishap and disharmony. Can the compass detect negative spiritual energy, how it affects the Feng Shui of a property and how to dispel it. In field studies, you will learn how to integrate the outside environmental factors by applying the laws of relativity and the correct Feng Shui formulae. You will also learn how to take the compass reading for the different types of site such as a village, condominiums, landed properties, shopping centres, etc. How to do a proper Landform Feng Shui audit without the use of the compass （羅盤). Differentiate building structures, signs and their respective five elements, how it affects health and business as well as how to counter and dissolve these disharmonies. The external environmental factors and how it can enhance or be detrimental to the Feng Shui of the house. Where to take the reference point while doing a Feng Shui audit in a forest or undeveloped land. Property selection techniques for both landed and high rise apartments. Authentic Water Techniques, Xuan Kong Da Gua and basics on date selection. Yi Jing, the 64 hexagrams, its practical applications and advanced date selection technique. Spiritual Feng Shui, apart from Space Cleansing, is about placing the altar in the right position, and how to identify the external environmental factors that might attract negative entities into the house. How a place with good Feng Shui and with everything in order according to Feng Shui can still face disharmony and mishap. What can be done to achieve the desired positive change and result. Who should take up this program? This is a one-to-one mentoring program for people who are serious in becoming a Professional Feng Shui Practitioner (PFP). Upon completion, Master Sanna will continue to support his disciples in their ensuing practice. Requirements: Make an appointment with Master for a selection interview. Successful applicants will be required to take an oath prior to commencement. Students must be sincere in learning and applying the knowledge as a Professional Feng Shui Practitioner; not as a coach, teacher, instructor, lecturer or trainer of Feng Shui or Spiritual Arts. Do not harbour evil thoughts. Have a clear conscience and with a good attitude you will definitely experience good results. Graduates are fully supported by Master Sanna when they encounter challenges during their Feng Shui practice. To make an appointment for the selection interview, click here and indicate your full name and contact number. This Mentoring Program is only held in Singapore, unless stated otherwise.